Most of the Garden’s crape-myrtle cultivars are in bloom now. 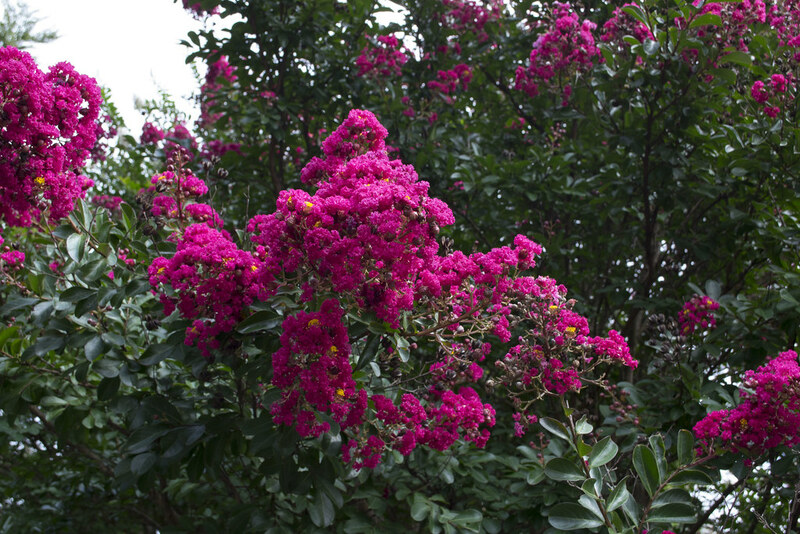 These large, multistemmed shrubs are members of the genus Lagerstroemia and are native to Asia, India, and Australia. Their extravagant panicles of crinkly flowers appear in a wide array of colors ranging from white to multiple hues of pink to red. In the U.S., crape-myrtles have long been favorites in Southern gardens and parks, but many cultivars are hardy in New York City too, even more so as the climate warms. Most members of the genus also have colorful fall foliage and smooth, pink and brown exfoliating bark, which extends the shrub's visual appeal into winter, after the leaves drop. At the Garden, most of the crape-myrtles are concentrated near the Lilac Collection and along Lily Pool Terrace. There are three shrubs along the stairway at the south end of the Osborne Garden and two rows of various cultivars lining the staircase leading from the Overlook to the Cranford Rose Garden. 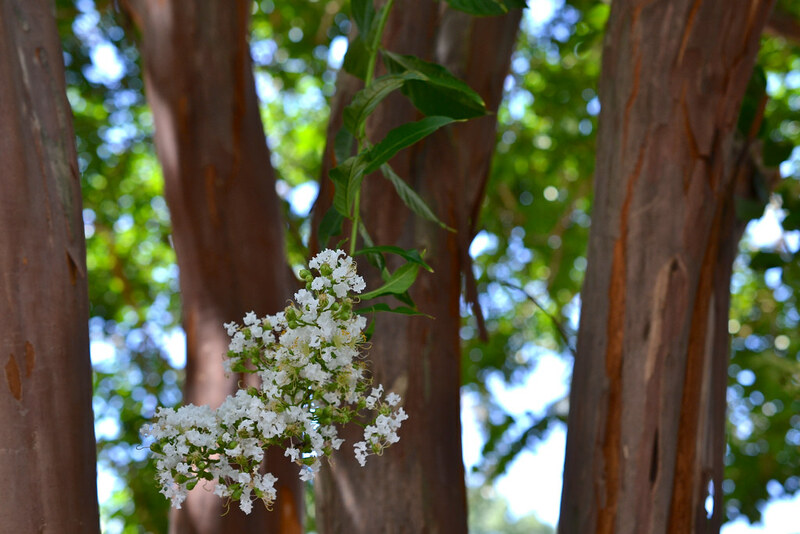 There are also two white-flowered crape-myrtles—‘Natchez’—in the Perennial Border and three specimens of ‘Muskogee’ at the south end of Lily Pool Terrace. These have purple-pink flowers and bloom a bit later than the rest. These beautiful summer blooms will likely persist through most of August. Be sure to see them! Lagerstroemia 'Natchez' (crape-myrtle) in the Perennial Border. Photo by Morrigan McCarthy. Lagerstroemia ‘Choctaw’ (crape-myrtle), taken in the Perennial Border. Photo by Lee Patrick. 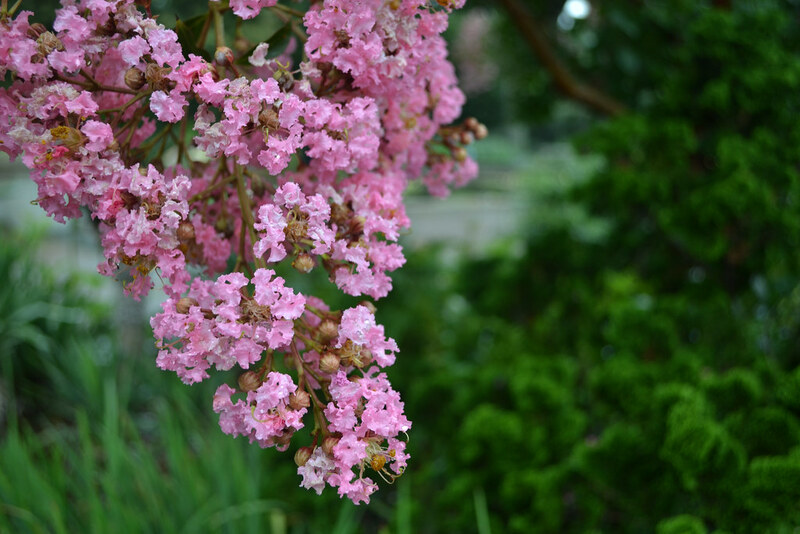 Lagerstroemia indica (crape-myrtle) at the entrance of the Osborne Garden. Photo by Alvina Lai. 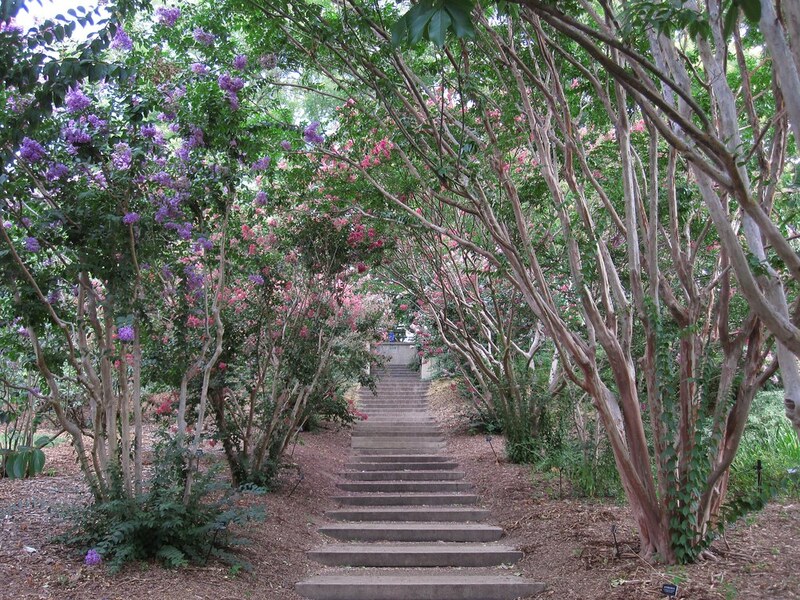 Crape-myrtle (Lagerstroemia) lines the stairs up to the overlook. Photo by Rebecca Bullene.